The arrogant, narcissistic mother of Thalia, Madaline figures in Chapter Eight of And the Mountains Echoed. While she’s lifelong friends with Odelia, Odelia begins to resent her constant talk about husbands and boyfriends. Eventually Madaline abandons Thalia, leaving her behind to live with Odelia and Markos. Madaline spends the rest of her life as a successful theater producer. The timeline below shows where the character Madaline appears in And the Mountains Echoed. The colored dots and icons indicate which themes are associated with that appearance. Arn, Jackson. "And the Mountains Echoed Characters: Madaline." LitCharts. LitCharts LLC, 8 Jan 2016. Web. 22 Apr 2019. Arn, Jackson. "And the Mountains Echoed Characters: Madaline." LitCharts LLC, January 8, 2016. 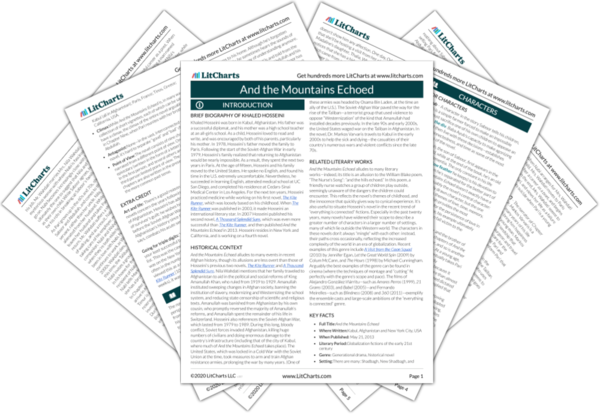 Retrieved April 22, 2019. https://www.litcharts.com/lit/and-the-mountains-echoed/characters/madaline.